Don’t drive with underinflated tires. Without proper air pressure, your tires are working harder than necessary. Underinflated tires put more strain on the side-wall, generating heat, and ultimately malfunction. Read your vehicle’s owner’s manual, or check the inside of your driver’s side doorjamb for the proper air pressure your tires require. Check your tire pressure regularly and do not over or underinflate – stick with your automaker’s recommended psi. Don’t overload your vehicle. Summer vacation season is approaching and more drivers will be traveling with their families. You may have suitcases, camping gear, and other items to take with you as you drive to your destination, but be careful to over-pack. Consult your owner’s manual to see what your vehicle’s Gross Vehicular Weight Rating is and be sure not to exceed it. Drive carefully. Slamming into a pothole, curb or debris in the road is never a good idea, but it’s especially harmful to your tires. 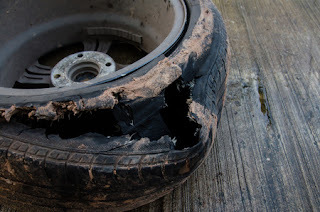 Sometimes hitting a pothole or other road hazard will cut through the rubber and cause a blowout immediately, other times, the damage won’t show up until later. Either way, it’s important to drive safely at all times. Taking good care of your tires and driving carefully go a long way in preventing tire failure. This summer, drive safely and avoid tire failure. If your tires do fail, see our guide on how to replace a flat, and visit the Melloy Dodge service center for any needed repairs and maintenance.